This bottle I bought in a nearby restaurant the other day. I love the name. It bears a striking resemblance to the famous McIlhenny Tabasco. Probably out of precaution the label now has been altered a bit, see the product catalog below. I always find it interesting to learn about ways how people are making a living abroad. Here in Thailand besides retirees, the majority of expats are English language teachers. It is quite hard to find other jobs, since similar to for example Europe, natives who qualify will favoured by law. Another option is to start up an own business. For those who do, an obvious choice is the hospitality industry, but a few more daring entrepreneurs start up something completely different. 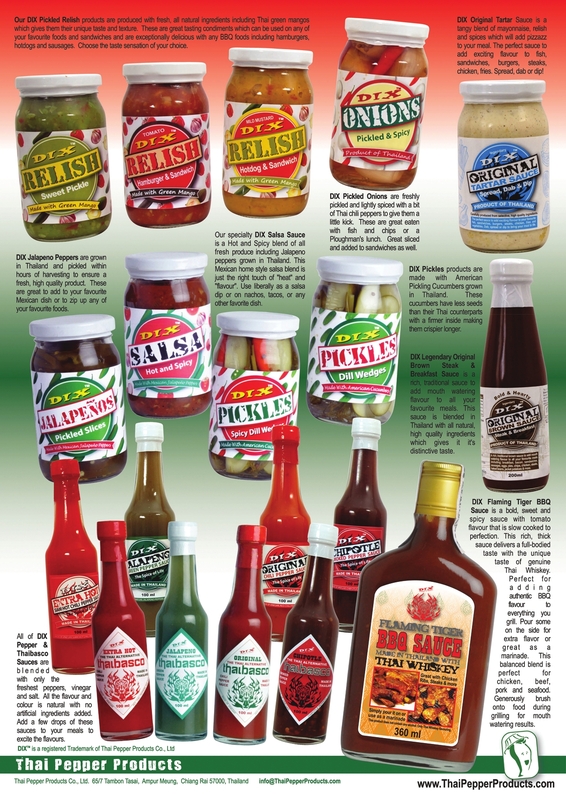 About five years ago Canadian expat Rob Denis got the idea to manufacture pepper sauces and bottled pickles. His company Thai Pepper Products Co., Ltd. is based in Chiang Rai. According to Rob the jalapeño peppers he grows require hotter days and cool nights to have a level of production that is commercially viable. Rob states that in Thailand these conditions can only be found in Chiang Rai. He adds that some of the production technology is from abroad, but all employees are from Northern Thailand and all products are 100% Thai. Thai Pepper Products customers include hotels, restaurants, institutional facilities, fast food outlets and retail stores. One of their prominent customers is the sandwich chain Subway Thailand, who currently boasts 47 outlets in the Kingdom. For more details about the company, check the website of Thai Pepper Products.